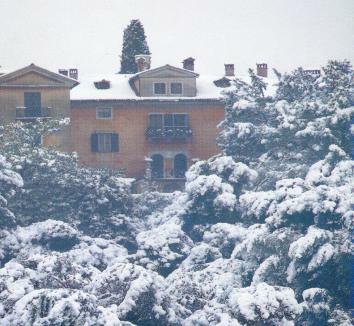 Originally constructed in the immediate north-western periphery of the town, today Villa Coronini Cronberg is in the heart of the city of Gorizia. Executed probably on a plan by architect Giulio Baldigara at the end of 16th century, on behalf of Carl Zengraf, the residence is characterized by a massive body developed on three floors with its nineteenth-century wing and loggia. 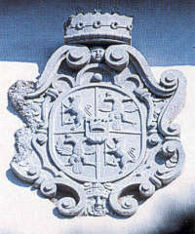 Today the Villa Coronini Cronberg is a relevant cultural entity. not only for the city of Gorizia, but for the entire Friuli Venezia Giulia Region. The severe facade of the palace finds a number of ornaments in the porch supported by four 2nd century powerful diorite's columns and in the airy terrace with two orders of arches. The terrace connects the villa to the chapel of 17th century where the last descendants of the counts Coronini Cronberg are buried. Counts Coronini Cronberg's family line, of Bergamo origin, concluded in September 1990 with the death of count Guglielmo Coronini, a fascinating man of versatile culture and artistic sensitivity; also a passionate researcher and collector. He has been a great personage for the city of Gorizia, distinguishing for artistic and historical preparation demonstrated in his writings and in the organization of important displays. Since 1990 the villa and the art collections have been managed by the Fondazione Palazzo Coronini Cronberg (Palace Coronini Cronberg Foundation), a private institution created according to his testamentary will: "the historical and artistic patrimony put together in the centuries from my family, completed and reconstructed to my benefit, it does not have to be dispersed, but to serve to the public enjoyment and the cultural education of the collectivity" recites a portion of his testament and then continues "the palace Coronini Cronberg with the annexed chapel (...) with all its furnishing, pictures, sculptures, archives, library and collections (...) with the park (...) will be an intangible and unalterable museum accessible to the public on perpetual remembrance of my family and as ornament and attraction of my city." The high value of the collections is testified also by the remarkable interest manifested by researchers and tourists who from 1992 have visited the dwelling that preserves its original furnishings. Between the rooms (mainly furnished in 17th century taste), there are the 'Venetian lacquer' lounges and the Room of Carl X, where on 6 November 1836, Carl X, the last king of France, guest of Count Coronini during his long wandering after exile from his country, died. In its rooms you may admire furniture in ebony and turtle, ivory and lapis lazuli, gilded mirrors, objects of Chinese taste and paintings of old masters like Titian, Tintoretto, Rubens, J. Van Ruysdael and other important painters of the 17th and 18th century like Bernardo Strozzi, Vittore Ghislandi, Alessandro Magnasco, Rosalba Carriera and Antonio Joli. There are also representatives of the 19th century painting in Italy (Pompeo Mariani, Guglielmo Ciardi, Angelo Inganni, Antonio Rotta), Austria (A. Hans Schram, J. Mathias Trenkwald) and France (Leon Richet and Eugene Boudin). Between the decorative arts there are precious chinas of Vienna, Capodimonte and Meissen; laces, ancient dresses, arms, carpets, silver items, glasses and crystals, coins and medals, archaeological finds, clocks and jewels, designs and prints (between which Rembrandt, Durer, Titian, Callot, Rosa, Bartolozzi and van Leyden). The archival patrimony is composed of thousands of documents ranging from the 13th to 20th century such as the library, composed of precious volumes ranging from the 15th to 20th century ('incunaboli', parchments, manuscripts, 'cinquecentine', 'seicentine' and 'settecentine', books of medicine and botanic, literature, jurisprudence, history, agronomy and art, in several languages). The park in English style of the Coronini villa (nearly 12.5 acres wide) is open every day from dawn to sunset, free of charges. Hourly Offices of Secretary and Direction: from monday to Saturday from 8.00 a.m. to 2.00 p.m. The Fondazione Palazzo Coronini Cronberg has a collection of over 500 pieces of Russian, English, German, Austrian, Danish, French and, obviously, Italian silver from 17th to 20th century. In preview for ASCAS members Dr.ssa Serenella Ferrari Benedetti, cultural coordinator and responsible of of the art collections of the Coronini Cronberg Foundation, presents the description of an interesting Venetian sugar bowl of the Napoleonic period. Bibliography: Ottocento di Frontiera, pp. 219 e 223. The sugar bowl has cup's shape with two handles finished with a flower. The square foot, supported by four lion's feet, is pierced with little arches and pine's motifs such as on the upper frame running along the edge of the cup. The foot of the bowl has a gadrooned edge and is joined to the cup by Acanthus leaves. It rests on a square base with four lions paw feet. The sugar bowl shows some Eastern influence in the pierced arches (a decorative solution typical of contemporary Turkish silverware) and the high level of craftsmanship of the silversmith. 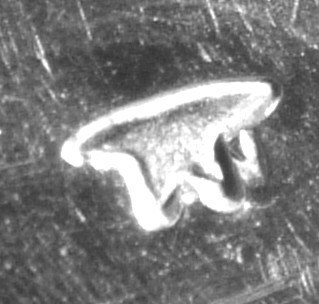 The rubbed silversmith's hallmark created great difficulty before its attribution to the Venetian silversmith Bartolo Milani, active in the first decades of the XIX century in San Silvestro 72, Venice. The lid, in the shape of overturned cup with gadrooned edge and a band of carved lilies, has an inventory's number different from that of the sugar bowl as the strict connection between the two objects was previously unnoted. 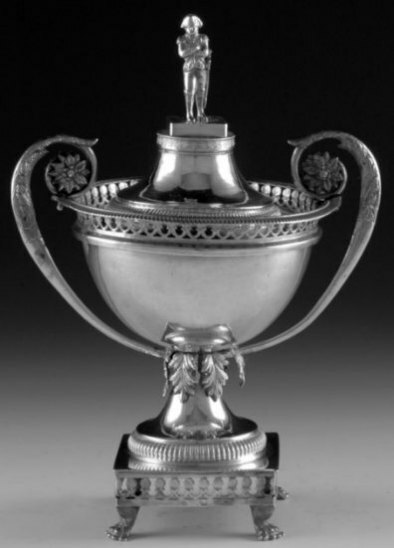 In a list of silver compiled by Count Guglielmo Coronini there's the sugar bowl with no hint to the lid - 'Empire cup - mark: globe with stars, comet (Italy 1810/76) Venice idem dg. 23' - which is associated with another item in the Coronini's collection defining the figure of Napoleon 'modern'. This sugar bowl was published for the first time in 1995 and described as 'lacking the lid usually in the shape of overturned cup' (Ottocento di Frontiera 1995, p. 223). Therefore neither the Count Coronini nor the author of the catalog were aware of the connection between the two objects, so that the lid was introduced in the catalog of 1995 with an independent card (IDEM, p. 219). The return of the lid to its 'legitimate proprietor' is now proposed thanks to the fundamental comparison with the sugar bowl produced by Bartolomeo Valazza (DONAVER-DABBENE cit., p. 30, fig. 14/f) fully similar to Coronini's piece with the exception of some small details like the bunch of flowers as the finial instead of Napoleon's figure. This Napoleon finds an interesting affinity in his pose with the bronze figure of the French general acting as the handle of an opaline glass bell preserved to the Palazzo d'Arco of Mantua (Ivi cit., p. 29).